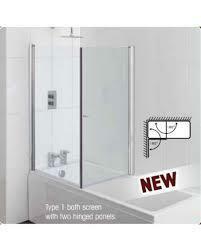 Universal glass shower screen to fit all baths with a flat surface. Please note we only ship glass screens on a pallet with your bath. We cannot supply this item by carrier. A screen that goes across the bath which forms a enclosure are available. See second image. This is available in 4 sizes. 700 / 750 / 800 / 900 mm. Use the options box below to select. 700/750 screens are the same price, we will confirm which one you require when we process your order.